Our $9.95 Leader. No. 1T1030 This sideboard is made of solid oak, golden finish, is 21 inches wide and 42 inches high, has handsome 12x20-inch bevel plate mirror, two top serpentine swell drawers and one large straight front drawer. One of the upper drawers is lined for silver. 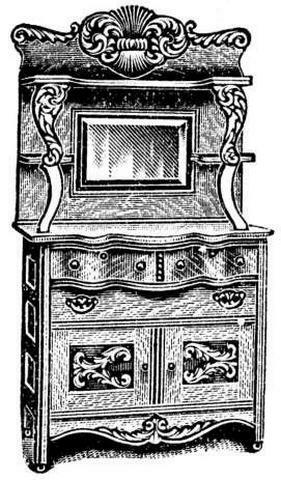 As shown in the illustration, the entire sideboard is handsomely decorafed with carvings and fancy brass knobs, handles and locks. Complete with set of casters and delivered on board cars in Chicago. Shipping weight, 175 pounds.